Where Is Milk In Your Diet For Gout? I’ve long been a proponent of seeking foods that are good for gout, rather than worrying about foods to avoid. Finding gout cures you enjoy eating or drinking, brings a smile to any gout sufferer. Today, I’ll revisit milk to bring us all up to date with the latest research, before I delve into my investigation of the myths and mysteries surrounding high protein foods. The 1991 investigation claiming milk is beneficial for gout appears to be somewhat ignored by the medical profession. Now, almost 10 years later, a similar investigation reports similar findings. I have not done a full comparison of the two milk and uric acid studies. For one thing, I do not have full access to the latest study. However, you should find plenty of useful information in this summary taken from the American College of Rheumatology (ACR) press release. Please note that I’ve paraphrased the original press release to make it more readable and relevant to us non-medical people. The full report about gout and milk has subsequently been published in the British Medical Journal . 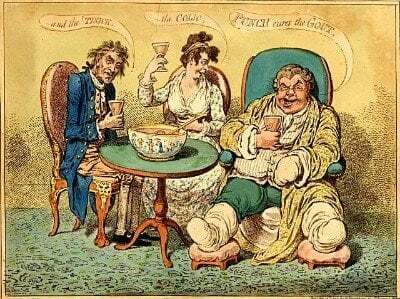 The ACR’s press release, ‘Got Gout? Get Milk’, promotes the research presented at their Annual Scientific Meeting in Philadelphia, Pa. It describes gout as a painful and potentially disabling form of arthritis with symptoms usually consisting of intense episodes of painful swelling in single joints, most often in the feet (especially the big toe). They note that treatments are already available to prevent or control arthritis associated with gout, but managing this disorder can be difficult, and treatment plans often have to be tailored for each person. I believe it is vital that treatment is planned individually, which is a key point in the Gout Freedom campaign. They note that previous studies indicate that individuals who drink a lot of milk have a lower risk of developing gout. Though not specifically referenced, this is almost certainly Choi’s statistical analysis linking high dairy consumption with lower gout incidence. Recent observational studies have highlighted the beneficial role of skim milk in prevention of gout. The aims of this study were to determine the acute effects of intact skim milk on serum urate concentrations and to examine the mechanisms of the urate-lowering effects of skim milk. Each participant received a single dose of each product (each containing 80 grams of protein) in random order. Researchers collected samples of blood and urine immediately before each participant drank one of the beverages and then hourly over a three-hour period. They completed this with each participant for each of the four beverages with a week in between each session. After drinking the soy milk, uric acid in the blood increased by about 10 percent. In contrast, all skim kinds of milk led to a decrease in serum uric acid by approximately 10 percent. All products (including the soy milk) rapidly increased the ability of the kidneys to remove uric acid from the body. Additionally, researchers found that late-season skim milk led to a greater increase in the removal of uric acid by the kidneys when compared to the other skim milk. Late season skim milk is primarily available from countries where milking is seasonal and cows are grass-fed, such as New Zealand and Australia, and is known to contain higher levels of orotic acid, a substance that promotes uric acid removal by the kidneys. There were no significant differences over time or between groups in changes in serum oxypurines (xanthine and hypoxanthine) or purines (guanosine and inosine). However, all products led to an increased excretion of xanthine. The press release concludes that the study showed that skim milk has a specific acute uric acid-lowering effect. The authors suggest long-term studies for further proof that it might be a good dietary source of gout cures. Now is a good time to seriously consider improving your diet with skim milk. Do not forget that even the lowest fat skim milk still has some energy, so if you are counting the calories make sure you plan this diet change properly. More importantly, you must realize that the uric acid lowering effects of skim milk, though significant, may not be enough to reduce your uric acid to a safe level. You must continue to check uric acid levels regularly to ensure that you remain safe. If you are used to drinking full-fat whole milk, I found that by gradually reducing the fat content, I was soon happy with the taste of skim milk. In fact, I now find full-fat milk far too creamy for my palate. There are more natural gout cures to lower uric acid in the Gout Treatment Section. Dalbeth N, Wong S, Gamble GD, et al. Acute effect of milk on serum urate concentrations: a randomised controlled crossover trial. Ann. Rheum. Dis. 2010;69(9):1677-1682. Do you have suggestions for improving Milk Diet For Gout? Then, please add your idea to GoutPal’s Suggestion Box. Or, send the Feedback Form, below.